Hearts for Hearts is releasing a new doll, and she is amazing! Her name is Aya, and she is a Syrian refugee. You can read about her here. Her story is a heart breaker, and I think it will be a great one to share due to current events. Hearts for Hearts is re-releasing some of their dolls that already exist, including Lauryce and Tipi. Here is the story about the re-releases. Sadly, the word is that she is tentatively scheduled for 2018. 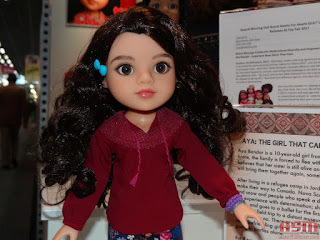 New AG doll: Nanea Mitchell!